weblin is one of the nominees in this years AlwaysOn Global 250 Competition! This is so great, we are really surprised to be on this bright listing in neigbourhood to freindster, hi5, Gaia Online, JaJah, meebo and so many other famous companies. 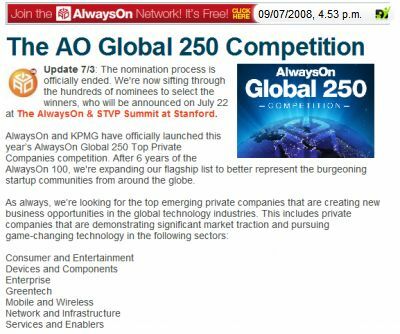 "AlwaysOn and KPMG have officially launched this year’s AlwaysOn Global 250 Top Private Companies competition. After 6 years of the AlwaysOn 100, we're expanding our flagship list to better represent the burgeoning startup communities from around the globe." Weblin is nominated in the "Consumer and Entertainment" sector. We are very excited and hope be on the final winners list, which will be announced on July 22.